Larry is a frequent speaker at conferences and association meetings. He has been featured on CNN as well as other national and local media, and has written for many publications. Dr. Levin holds a BS from the University of Florida and a PhD in clinical psychology from Georgia State University. He has been on the Board of Advisors for the Metro Atlanta Chamber of Commerce, as well as a member of the City of Atlanta Ethics Board and the American College of Healthcare Executives. 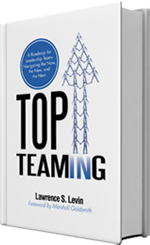 Larry is available to speak and consult to senior leaders and Top Teams on the concept and process of Top Teaming, including developing a plan to integrate the Top Teaming methodology into the organization’s culture. He is currently deploying the Top Teaming process with global and national Fortune 1000 companies, complex healthcare organizations and midsize firms ranging from large global manufacturing, technology, and pharmaceutical firms to national telecommunications, retail, construction and service companies. For more information on The Levin Group and the consulting services available, visit The Levin Group online .